The storied history of both the ISPS Handa Premiership and National Women’s League will be celebrated this weekend when New Zealand Football joins forces with the competing clubs and federations to mark the inaugural Heritage Week. New Zealand Football will be celebrating the occasion with a range of content across its online platforms, including videos, graphics and stories. The clubs and federations are also taking the opportunity to celebrate their past players and achievements as the country’s two premier national football competitions continue across the country. All teams playing at home are joining the celebrations in their own way, which will include inviting former players to games, dedicating match day programmes to historical images and facts, and publishing heritage-based content on social media platforms. To mark 125 years of women’s suffrage in New Zealand, all teams in the National Women’s League will also be wearing purple armbands. It will be a milestone weekend as it is the first time New Zealand Football has celebrated the history of its national leagues in such a way and Dan Farrow, Competitions and Events Director, says it’s important to reflect on their legacy. “Both are relatively young competitions in global terms but they have made a significant impact on the footballing landscape in this country and there is much to look back on,” he says. “The tagline of the national leagues is ‘Where Football Ferns and All Whites Are Made’ and this has certainly rung true over the years with a number of players starring in both the ISPS Handa Premiership and National Women’s League before going on to represent their country and play professionally overseas. In this way, the national leagues play a vital role in talent development but they do not just serve to produce players, the trophies in both competitions are also highly sought after and are regarded as the pinnacle of the domestic game,” he adds. 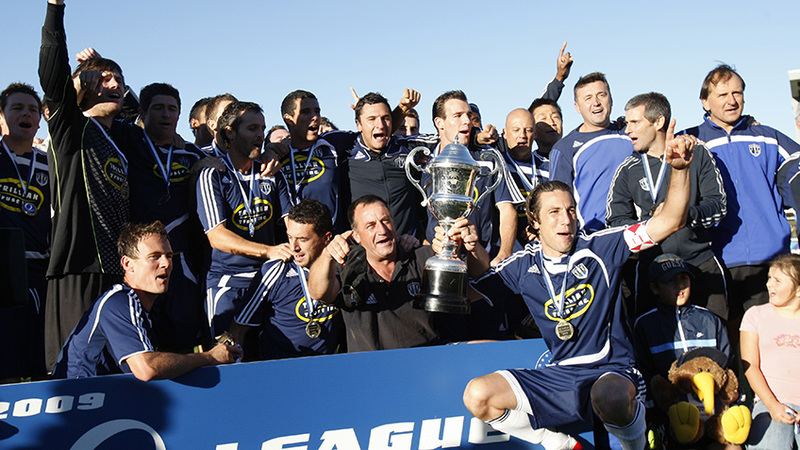 A men’s national league has been in place in New Zealand since 1970 but the current competition was not established until 2004 as the New Zealand Football Championship (current sponsors ISPS Handa came on board last season). Eight teams were inaugural members of the competition – Auckland City, Waitakere United, Waikato FC, Napier City Rovers, YoungHeart Manawatu, Team Wellington, Canterbury United and Team Otago – with Auckland City going on to be crowned the first ever champions. They have since claimed a further six titles while cross-town rivals Waitakere United have earned five. The monopoly of the pair was finally broken when Team Wellington won back-to-back titles in 2015/16 and 2016/17. Many outstanding players have graced the ISPS Handa Premiership over its 14-year history, including the likes of imports Roy Krishna, Benjamin Totori and Albert Riera – who all went on to play professionally in the Hyundai A-League for the Wellington Phoenix. Other notable alumni are Auckland City’s South African pair of Grant Young and the late Keryn Jordan while a raft of All Whites have also thrilled fans, such as Ivan Vicelich, Danny Hay, Michael Utting, James Pritchett, Aaron Clapham, Ross Nicholson, Ben Sigmund, Jake Butler, Jonathan Perry, David Mulligan, Andy Boyens and Allan Pearce. The most notable recent product is All Whites and PSV Eindhoven star Ryan Thomas, who took his first steps in senior football with Waikato FC before making his mark in Europe. The National Women’s League has also been home to a wealth of top-class talent, most recently helping to hone the skills of current Football Ferns Meikayla Moore, Erin Nayler, CJ Bott, Emma Rolston and Katie Rood before they embarked overseas to begin professional careers. Prior to that, many legendary figures starred in the league, including Maia Jackman, Hayley Bowden, Kirsty Yallop, Amber Hearn and Terry McCahill. A female national league first took place in 2002 featuring teams from the country’s seven federations and the inaugural winner was Auckland Football. They went on to claim another six championships in quick succession and returned to their glory days last season with another title while the most successful team in recent years is Canterbury United Pride, who have won the league in three of the past five campaigns. The Northern Lights also have three titles to their name while Capital Football have two. The latest edition of the ISPS Handa Premiership is currently being jointly led by Eastern Suburbs, Team Wellington, Auckland City and Hamilton Wanderers while Canterbury United are top of the National Women’s League.